Rowan Atkinson is back as the bumbling British spy in the 2011 sequel hitting Blu-ray in February. 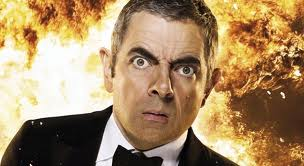 In an early announcement to retailers, Universal is preparing 'Johnny English Reborn' for Blu-ray on February 28. As previously reported, the original 2003 'Johnny English' will also be available on the same date. The Blu-ray/DVD/Ultraviolet Digital Copy will feature 1080p video, a DTS-HD Master Audio 5.1 soundtrack, and supplements include: Feature commentary with director Oliver Parker and screenwriter Hamish McColl; Deleted/extended scenes with introductions by Oliver Parker; The Wheelchair Chase; Gag reel; as well as the Blu-ray exclusive The English Files: The Making Of Johnny English Reborn; Working With Rowan; Gadgets; English In Hong Kong; Pocket Blu and uHear. You can find the latest specs for 'Johnny English Reborn' linked from our Blu-ray Release Schedule, where it's indexed under February 28.